Someone is killing people around Lake Tahoe. And the chase is on. In Tahoe Chase, PI Owen McKenna is hired by Joe Rorvik to find out who tried to kill his wife by pushing her off the deck of their mountain home. Rorvik is an elderly Olympic skiing medalist who doesn’t believe the police reports that say his wife’s fall was an accident. McKenna is sympathetic, but Rorvik is at a loss to name anyone who might even remotely want to hurt his wife. Suspects are initially scarce save for a 6-foot, 3-inch, 220-pound knife-throwing wife abuser who seems intent on not only getting McKenna off his trail, but off the planet. Before long, a murder, possibly related to the assault on Rorvik’s wife, puts more emotional strain on McKenna’s 92-year-old client who now regrets ever calling the detective and threatens suicide. Later, the Tahoe detective seems to have a better grasp of what’s happening–but it’s only temporary. In a crucial scene late in the book, he and his cop friend, Diamond Martinez, frantically chase clues and suspects around in their heads until it’s clear neither has a good idea of where the case is going. Clues are not the only things chased here. The novel’s title could refer to chases in cars, boats, skis and on foot, all of which add action and suspense throughout the book and keep the plot moving ahead swiftly. Author Todd Borg’s unusual, quirky–sometimes bizarre–characters add to the complexity of the story, keeping the PI chase fresh and appealing, not to mention puzzling. McKenna occasionally mentions a previous case and he even borrows a cabin cruiser from a former client. The detective has lots of previous cases to ponder, if he chooses, as Tahoe Chase is Borg’s 11th Owen McKenna whodunit. Fans of McKenna will appreciate the ways this case is different from previous novels. Yet the familiar cast of characters is still here including McKenna’s entomologist girlfriend Street Casey, his Great Dane, Spot, and his law enforcement friends from California and Nevada jurisdictions around the lake. 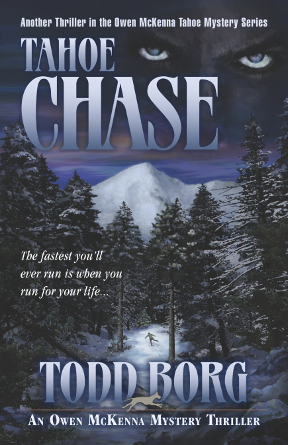 Tahoe Chase, like Borg’s other books, has background subjects, areas of specialization related to suspects or victims and readers gain insight on new topics as they work on the case with McKenna. In Chase, readers learn details about such diverse topics as skiing and domestic abuse. In one of his earlier novels–and one of my favorites–Borg took up the topic of autism. In Tahoe Silence, a young autistic girl is kidnapped and terrorized by a biker gang. McKenna–and readers–learn valuable lessons about autism delivered in a more sensitive way than you might expect in a PI novel. Borg’s sensitivity comes through in his books. McKenna has a code. Not only does he not use firearms–as a result of a tragic shooting when he was a San Francisco cop–but McKenna treats his girlfriend (as well as most everyone else) with respect and no matter how depressing a case may be, he never gets drunk or beats up on people except in self-defense or defense of others. This is not to say that McKenna is a schoolboy. He’s devised ingenious (and sometimes quite painful) ways of dealing with criminals, he sleeps with his girlfriend (although readers never get in bed with them) and he loves a good bottle of wine or a Sierra Nevada Pale Ale. Along the way to solving a crime, McKenna usually offers simple wisdom in the form of observations or occasionally as advice to friends. In a scene in Tahoe Silence he finds himself on the losing end of a misunderstanding with his girlfriend. I suddenly stopped as I remembered the proverb that says when you find that you’re digging yourself into a hole, stop digging. I’d learned long ago that patience was often rewarded. Certainly impatience rarely was. When McKenna and Casey are trying to console a young woman who’s been brutalized and is now facing a daunting journey, McKenna is impressed with his girlfriend’s supportive technique. Talk only about trivial stuff, and it communicates that you’re worried about the big issues and are afraid to focus on them. Talk only about the major stuff, and it clutters the traveler’s mind with too many concerns. Strike a medium balance, and the person knows that you understand the scope of the mission, but you are still relaxed about it. The relaxed manner telegraphs confidence in the person who is about to embark on the big event. McKenna’s philosophical observations aren’t always designed to advance the plot, but you get a more clear understanding of the protagonist as a fully developed character. Meanwhile, back at the Chase, Borg keeps McKenna, Martinez and Rorvik guessing until almost the final scene when the complex plot twists back on itself and the murderer is revealed. Tahoe Chase is not a sprint but a marathon giving readers cerebral and emotional exercise along the way. Borg fans will enjoy the chase and eagerly await the ending, and first-timers will want to find the early books in the McKenna series and start following Lake Tahoe’s coolest character.